We want you to THINK WILD! 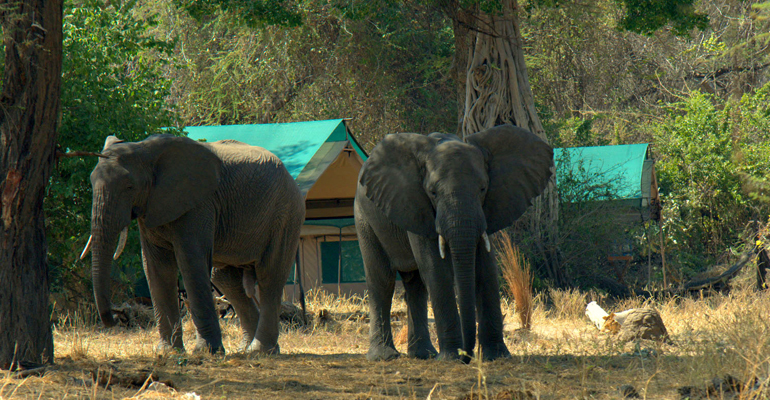 Ruaha national park is the biggest and wildest national park in Tanzania. And we want you to get lost in it! 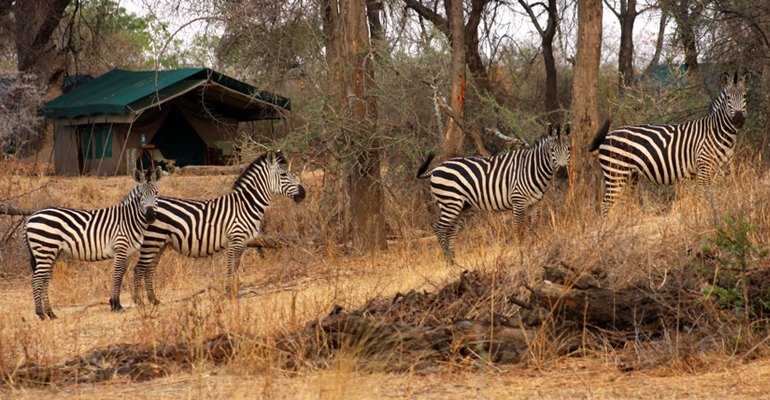 We want you to feel the real wilderness, far from everybody else, with only wild animals as our companions. Nothing can make you understand you are an animal yourself more than the roar of a lion next to your ear! When we understand we are animals ourselves we shall surely become aware of the importance of their protection and conservation. 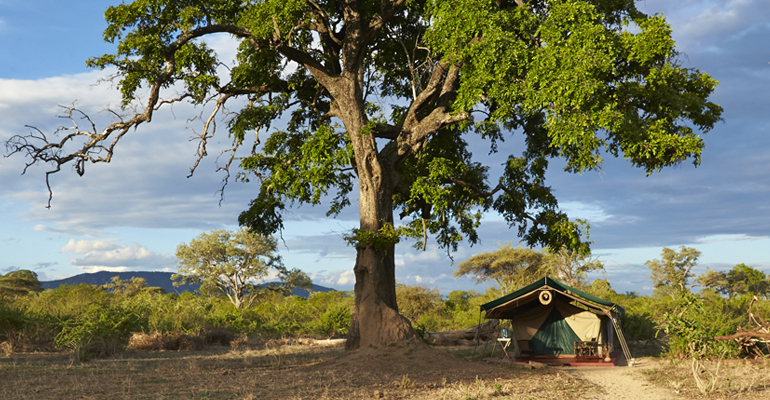 In a way, a stay at Mdonya Old River Camp, is a journey to meet our very ancient roots, a time when we were actually part of the bush ourselves, in harmony and equal to all other creatures. You will fly to the heart of Tanzania, in the center of the country, to a plateau located a thousand meters high at the footstep of the Rift valley. That is where the Mdonya Old River is. Even though we are animals, we do like to have all our comforts but be extremely light footed. 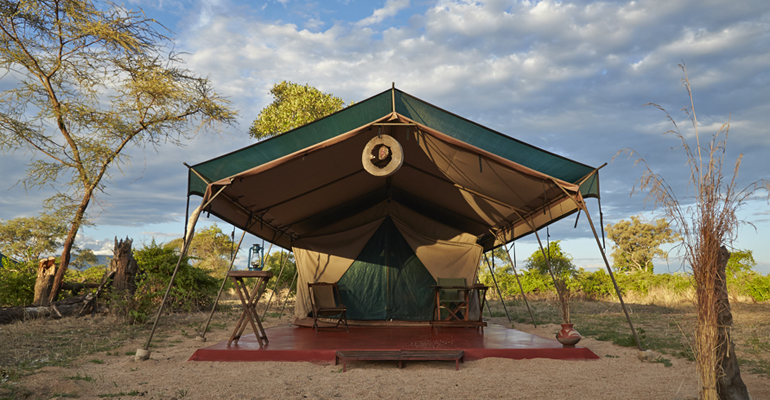 Twelve tents nestled in a spacious area under the shade of large sycamore figs and Faidherbia albida, spaciously located along the curving banks of the Mdonya sand-river. 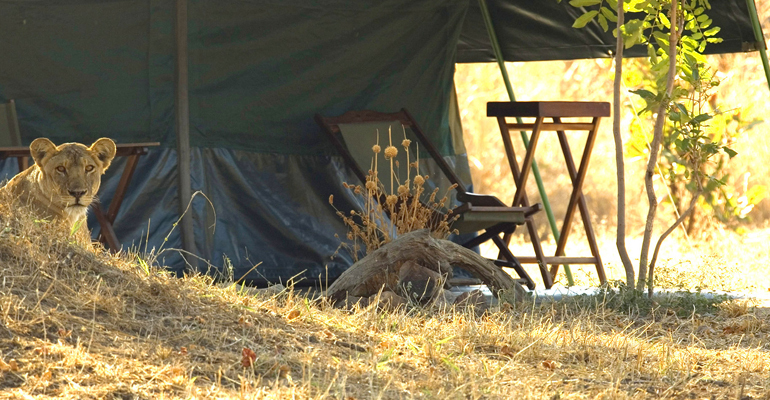 Each traditional safari tent is comfortably furnished, catering for solo travelers, couples or families. 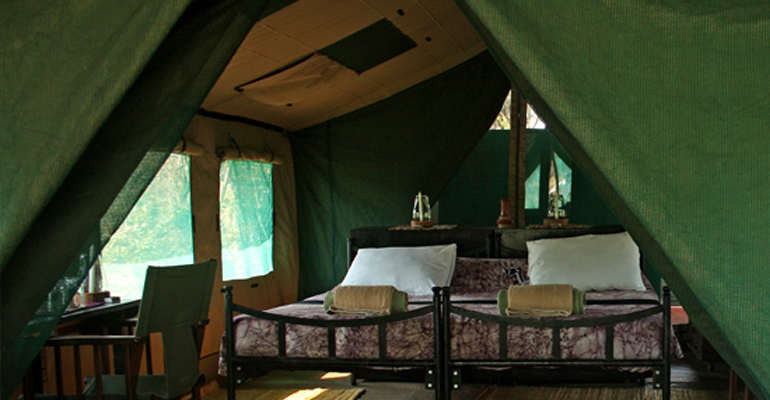 All the tents have ensuite bathrooms with dressing room, open-roofed solar heated shower and separate flush toilets. 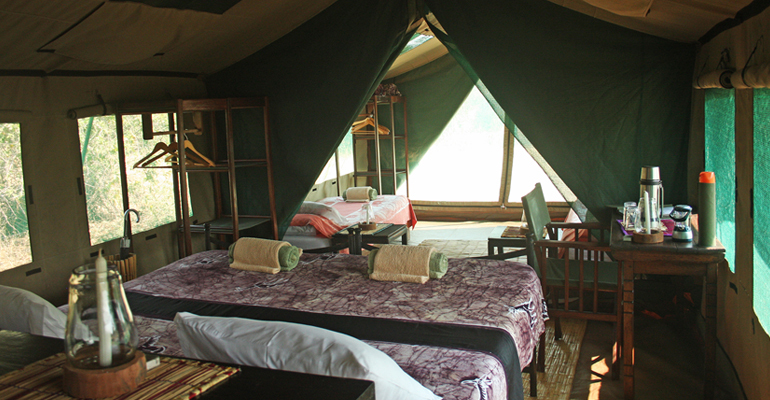 Mdonya tents can be modified to host families, adding an extra tent room on the veranda. 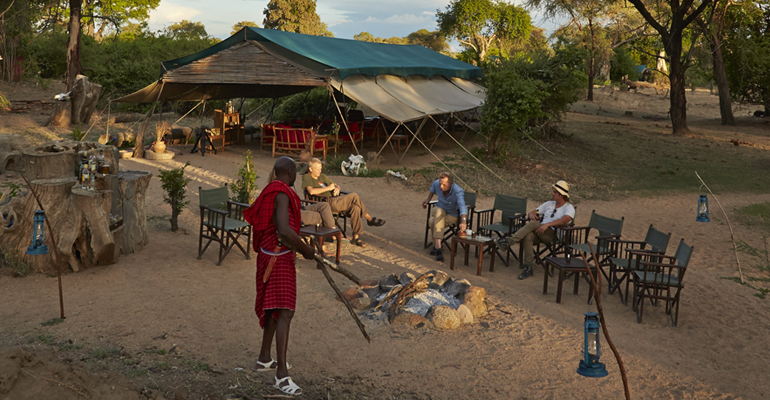 The large verandahs are an ideal place for relaxing in between activities or simply to enjoy the view of wildlife passing by. Alternatively help yourself to complementary tea or coffee in the lounge, browse through our selection of wildlife books or make a purchase at our gift shop to support some of our community-development or conservation activities. 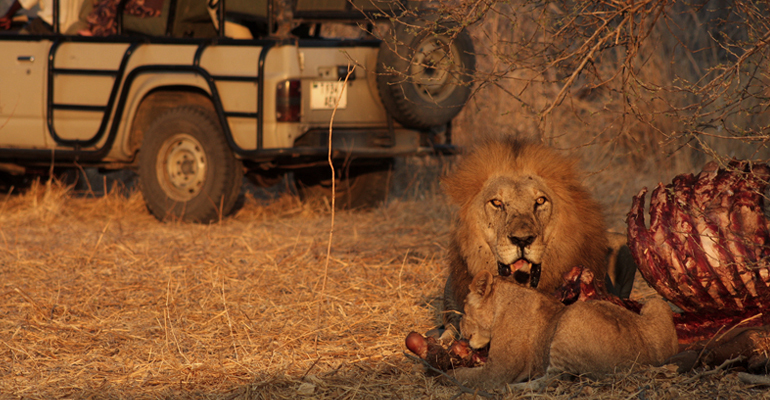 Game drives are flexible and not limited by any schedule! Guests get a chance to see the breathtaking mosaic of ecosystems, from the river pools to the acacia grasslands and wooden forests. There are Baobab valleys and sand rivers fringed with Hyphaene petersiana palms. Monolithic granite boulders dating from the formation of the Great Rift Valley and exposed by erosion litter the area. 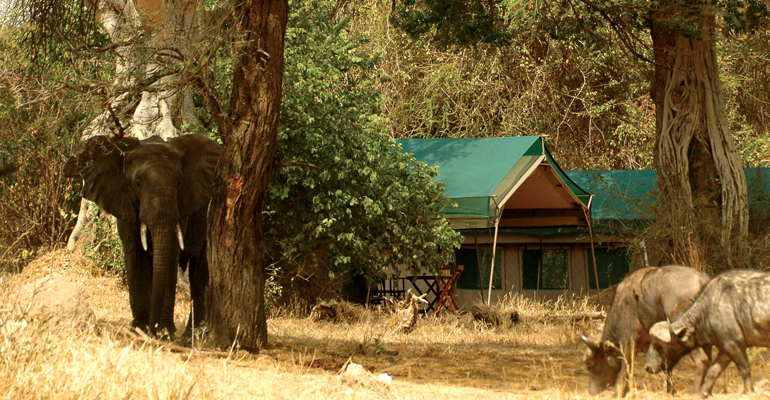 Enjoy every second of the beauty of Ruaha with Mdonya’s bush breakfasts, bush lunches and sundowners, on a open game viewing vehicle! 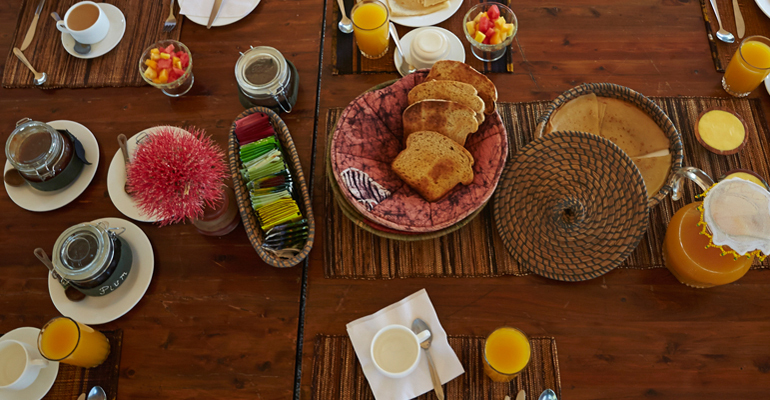 In keeping with Mdonya’s philosophy of low impact tourism the camp has consciously made green choices to reduce our ecological footprint. Consciously designed to remain simple, the camp’s rustic setting incorporates you in the natural environment to make you feel part of the ecosystem. Additionally we have taken the following measures to minimize our carbon footprint and contribute to social development. – enjoy a warm shower and charge your batteries with the power of the natural rays of the sun. Solar power is the dominant source of our electricity at Mdonya and in keeping with the theme of renewable energy Mdonya uses rechargeable batteries to reduce consumption of disposable batteries, reducing waste. 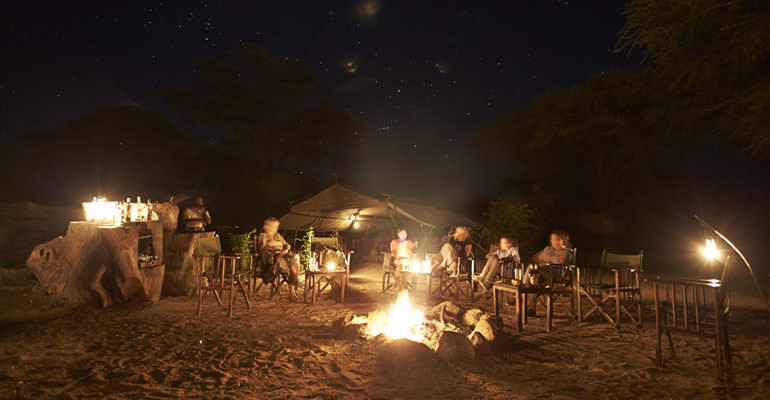 – Old-fashioned candles and kerosene lanterns light up the camp to provide a true safari experience; nothing else can reproduce the same warm and rustic atmosphere! The main cause of deforestation in Tanzania is the felling of trees for firewood and the production of charcoal, with 3,000 sq km a year deforested for this purpose regardless of the prohibition of firewood collection or logging in Tanzania. At Mdonya however you can enjoy our daily baked bread, pizza, cakes and more, fresh from our gas oven – all home-made. Reducing our eco-footprint involves also sourcing foods locally but this doesn’t mean we eat baobab fruits and game meat, but we deliberately try to maintain our policy of buying fresh produced and often-organic local products to both stimulate local economies and reduce fossil fuel consumption necessitated in long distant transportation. Tanzania’s fertile land produces incredible food products and the Iringa region in particular is home to some of them including tea and jam, cheese, fruits and vegetables and all kinds of meat. None of our products have traveled a long distance before being deliciously prepared and served for your enjoyment. In particular our Jams are sourced from “Vijana Iringa Products” a project of the Imani group produced by the Iringa Young Women’s Project. The renowned homemade jam and marmalade are free of additives and preservatives. Mdonya recipes are further enhanced by use of mozzarella, caciotta and provolone cheese provided by the “Njombe Milk Farm” which is a successful community project that started with the support of an Italian NGO and an Italian-based milk factory. Further information can be found on: www.africamilkproject.org. Mdonya supports the Kipera villagers’ economy (a village some kilometers outside Ruaha) buying, once a week, their fresh and dry good products. By Air: There are daily flights with Coastal Aviation both from Dar es Salaam/Zanzibar as well as Serengeti. For Mdonya Old River Camp landing and taking off is from Msembe airstrip in Ruaha National Park. By car: From Dar es Salaam, it’s a one and a half day journey. We suggest from Dar to sleep over in Iringa the first night (Dar-Iringa 600 Km tarmac), the following day proceeding into Ruaha National Park (120 Km of gravel rd). Consider that the gate to the park closes at 18.00 and that from the gate to Mdonya Old River Camp it would be another 45 Km.